Developed in relation to works by Tacita Dean and William Kentridge, this article explores the way in which the arrival of digital technology has impacted upon our conception of drawing, suggesting its alignment with older, ‘analogue’ technologies, particularly film. As art historian Michael Newman suggests, the meaning of drawing’s specific qualities is conditioned by the field of other visual technologies with which it shares a space at any one time. As verb or as noun, drawing will appear differently when considered in relation to painting or to writing, to sculpture or printmaking, to photography, film, or digital media. Indeed, it is argued here that a richer and more precise conception of drawing’s specific capacities can be arrived at by exploring its alignments with, and differences from, other forms of practice, rather than by attempting to determine the properties supposedly intrinsic to drawing in itself. Because the field of available technologies is constantly shifting, this kind of relational definition of drawing would also need to be acknowledged as historically contingent. A second aim, however, is to exceed the specifically technological dimension of the analogue/digital opposition, and to explore the way in which this binary might also be used to specify a conception of thinking as backgrounded by the body’s liveliness and interference. That is, how concepts and processes associated with the analogue are particularly attuned to articulating the kinds of conversions involved in embodied perception, as well as the intensive or affective register of those processes. This shift in emphasis draws the discussion away somewhat from the issue of medium specificity, and towards more phenomenological questions regarding duration and embodiment, which are nevertheless crucial in thinking about the production and reception of drawings. As media theorist Lev Manovich explains, whether built from scratch on computers or sampled from analogue sources, digital media objects are characterised by their reducibility to a uniform numerical code, to vast sequences of I/0 combinations.7 This kind of composition stands in contrast to analogue signals, which are continuous in both time and amplitude and are irreducible to a numerical form. In an analogue microphone, for example, a continuous sound wave is converted (or transduced) into an electrical signal, with each modulation in amplitude registered in a corresponding change in voltage. An analogue signal can also be translated into digital data in a process involving two steps: sampling and quantisation. Here, a continuous signal is converted into a series of discrete units, each being then assigned a numerical value. This process inevitably involves some loss of information, depending upon the frequency with which samples are taken (sampling rate) and how finely the output values are differentiated (resolution). The indifference of algorithms to medial contents or sensory fields means that, as critical theorist Mark Hansen argues, ‘the very task of deciding what medial form a given rendering shall take no longer follows from the inherent differences between media (which have become mere surface differences).’11 Digital image files such as JPEGs and TIFFs are composed of pixels, the values of which are derived from a uniform code, distributed on a pre-arrayed grid. The analogue image, by contrast, is the product of photochemical processes that do not have recourse to any such intermediate coding in their qualitative conversions of light. Aside from within various exhibition spaces, conferences and publications specifically devoted to new media and digital art (for example, SIGGRAPH and Ars Electronica), drawings made using digital means are still largely absent from the landscape of major exhibitions and publications devoted to post-war practice.17 This relative invisibility takes place against a backdrop of the ubiquity of software programs such as AutoCAD (first released in 1982), which have revolutionised the world of architectural, commercial and industrial draughtsmanship. Digital drawing tools have afforded artists and designers an extraordinary array of capacities to produce, store, overlay, rework and duplicate graphic schemes. The mouse or stylus replace conventional drawing tools, and the frictionless luminosity of the computer monitor is substituted for the tactile grain of the paper sheet. Since the 1980s, digital drawing tablets have been available for the home computer. Here, a sensitised surface acts as a page, with the drawn image usually appearing on a separate monitor.18 Sensitivity to the pressure and tilt of the stylus is now very acute, and the replication of visual effects generated by different brushes, pencils, crayons and erasers extremely sophisticated. The relative invisibility of digital drawing in a visual art context suggests that, despite numerous claims for the waning of the aura of the art work since Walter Benjamin’s famous (and ambivalent) essays of the 1930s, a fascination remains with drawing’s tracing of the singular, finite activity of its own making.19 While the expressive doxa that drawings provide access to the artist’s inner being have not survived the practical and theoretical onslaughts it has sustained since the 1960s, it remains apparent that the drawn mark does evidence the process of its making with particular immediacy.20 What claims can legitimately be made for the meaning of that bodily residue is an open question, but, at least since the invention of the printing presses, the idea of the authentic corporeal trace has remained important to the phenomenological encounter with drawing, even if the dominant emphasis, at least since the 1960s, has shifted away from the conveyance of expressive contents and towards the more literal elaboration of systems, signs and processes.21 This involvement of the body in the production of drawings nevertheless implies a responsive relationship with conscious intentions or unconscious processes of the artist, and contrasts both with the production of most photographs, which tends to actively bypass the interference of the maker’s body, and with the numerical mediations involved in digital images. Together with its changed relationship to the body, digital drawing also involves a movement away from the material heterogeneity common to ‘manual’ drawing practices. When compared with painting or sculpture, drawing would hardly be thought of as dramatising its materiality; indeed, as French art historian Henri Focillon wrote in the 1930s, ‘[Drawing involves] a process of abstraction so extreme and so pure that matter is reduced to a mere armature of the slenderest possible sort, and is, indeed, very nearly volatised.’ However, Focillon continues, ‘matter in this volatile state is still matter … Its variety, moreover, is extreme: ink, wash, lead pencil, charcoal, red chalk, crayon, whether singly or in combination, all constitute so many distinct traits, so many distinct languages.’22 In light of drawings by Joseph Beuys, Ed Ruscha or Cornelia Parker, for example, Focillon’s list is in need of radical extension, but the way in which drawing foregrounds the variety, contingency and fragility of its material constitution continues to be crucial to its effects. In its slightness, drawing’s materiality can become more rather than less powerful: from the flickering miasma of Georges Seurat’s black conté chalks on Michallet paper, to the truant bleed of Henri Michaux’s supple, inky glyphs, to the delicate activation of Agnes Martin’s infinitesimally differentiated grids.23 Drawing’s precise engagement with a material spectrum of liquidity and dryness, frangibility and obduracy, porosity and impermeability, remains a vital source of its power, foiled as it is by the ubiquity of everyday interactions with the durable plastics of computer hardware. Moreover, the materiality of drawing is not only important to the mark as it is inscribed, but also as it is removed. In the process of writing or drawing on a computer, it is very easy to delete a pixel or character, instantly removing it from view.24 Erasure works differently, and it is impossible to actively erase a material mark without some effort or residue. Both Dean and Kentridge dramatise this work of erasure, the insistent visibility of which announces their shared attachment to the temporality, materiality and bodily investments made newly visible in ‘analogue’ drawing by the arrival of the digital. Tacita Dean’s The Roaring Forties: Seven Boards in Seven Days 1997 (figs.1–2) is composed of seven eight-foot-square blackboard panels bearing white chalk drawings and fragments of written script. They describe the progress of a sea adventure, complete with raging storms, an imperilled crew and an eventual homecoming. The sequence begins with a minimally worked panel, annotated with a title at the top: ‘Roaring Forties – an epic C19 sea movie’, as well as some initial filmic cues: ‘fade up from black’, ‘start’. The second board shows a crew of sailors clewing the sail (‘long take’); in the third, the presence of a gliding albatross warns of what is to come: in the next two boards the vessel and its crew are in trouble, thrown and listing amidst a howling gale. By the sixth board, a close-up of the swell with no horizon, the storm has subsided, and the seventh and last board offers a happy ending as the surviving sailors row into frame and towards dry land. As its full title suggests, the series was made over seven days, with Dean working in situ at The Drawing Center in New York. The blackboards retain the foggy traces of erased and re-worked passages, particularly evident in Boards II and VI.25 The chalk sometimes dissolves into a grey mist, and at others trails the outline of forms like a running current. The visible work of erasure further foregrounds the performative dimension of the drawings, with the time and labour of their making openly exhibited on the surface of each board. These unstable drawn images interact with clusters of short text fragments, which offer directions for imaginary camera angles (‘close up on swell’, BD6), special effects (‘fx wind’, BD4), atmospheric conditions (‘wind abates’, BD5, ‘full sunlight’, BD7), exclamations (‘man overboard’, BD5, ‘land ahoy’, BD7), extra descriptive details (‘capable hands’, BD4) and narrative progress (‘she’s still afloat (just)’, BD5). The Roaring Forties refers to a zone in the southern Atlantic, between 40° and 50° latitude, infamous for its treacherous winds. The drawings were made at the beginning of 1997, just a few months after Dean completed her breakthrough film, Disappearance at Sea (1996), which she famously related to the ill-fated sea voyage of amateur sailor Donald Crowhurst.30 Shot at dusk at Berwick Lighthouse in Northumberland, the film moves between close-up footage of the rotating lighthouse lamp, and broader views of the sea, cliffs and setting sun. The opening sections are dominated by the hypnotic rotations of the lamp’s clanking machinery and the chromatic intensity of the sunset. As darkness descends, the bulb is illuminated and projects its rays into the night. In the slow final shots, the sense of fragility and isolation is palpable, as the beam is all but smothered by the gathering darkness. Metaphorical connections with Crowhurst’s precarious mental state seem inevitable. The film closes with a finger of light cutting through the blackness with a slight, glancing beam, which barely picks out details of the rocky cliffs and the shifting surface of the night sea.31 The May 2006 display of Dean’s works at Tate Modern offered a suggestive juxtaposition of The Roaring Forties with Disappearance at Sea. Walking out of the darkened room in which the film was installed and into the neighbouring space with these cinematic blackboards, it was difficult to avoid the rhyme between that fragile beam of light projected into the night and the white chalk marks which emerge from their black ground. At 2400 x 2400 mm each, the impressive scale of the blackboards invites comparison with the cinematic screen, immediately distancing them from the connotations of privacy and modesty with which drawing’s more conventionally intimate proportions are frequently associated. Dean herself has made explicit the connection between her blackboard drawings and cinematic forms, describing them as ‘dysfunctional storyboards’.32 Although not exhibited in the order in which they were produced, the seven boards come to make sense as a series: narrative action is implied between each board, in the gaps, and the written directions signal various atmospheric conditions and instructions for how the depicted action might be articulated in film.33 In BD4, for example, as six sailors are hauled over a mast gathering in the sails, instructions are left for a cameraman, signalling various actions and effects: ‘ACTION – out on the yard,’ ‘zoom in expression of fear,’ ‘look yonder (out of frame),’ ‘fx wind.’ A curved arrow with the words ‘to and fro’ indicates the movement of the mast as it sways in the wind. These written cues invite the viewer’s imagination to animate the image, producing an array of internally enacted zooms, pans and sound effects. Dean herself has commented: ‘These huge wreckings, that scenery, they are not really related to films that I might make, but it’s in order to give the impression that these are films already. Somehow, they are films.’34 In a recent essay, art historian Pavle Levi has theorised a form of practice that he names ‘cinema by other means’, and describes as ‘the practice of positing cinema as a system of relations directly inspired by the workings of the film apparatus, but evoked through the material and technological properties of the originally non-filmic media’.35 This mode of practice, for Levi, can invest static objects with ‘a creative potential to generate an entire set of kinetic, film-like effects’.36 Levi’s concept is certainly helpful in thinking about Dean’s blackboards, which notably involve a much more complex range of cinematic techniques than are found in her celluloid films which are generally composed of lengthy, locked-off static shots, devoid of any such zooms, pans or dissolves. Opening a 2001 essay on Dean’s work, Michael Newman asserts that ‘The mediums of art are concretions of time’, with each medium and each art work serving to ‘delay, condense and spread out time in their own way.’37 The temporal structure of The Roaring Forties is complex. The boards evidence the time of their making, whilst also re-shuffling the chronology of that process; they constitute static objects, but it is also hardly possible to resist animating them while we look, given the many and varied cues provided by the artist. Dean has herself commented that these boards fuse the conventions of the storyboard with those of the production still: both the before and the after of the cinematic event.38 This amounts to a complex interplay of movement and stasis, continuity and rupture, material facticity and imaginative projection, pairs of terms that are also characteristic of the operations of film (‘cinematograph’ itself meaning the writing or drawing of movement). The temporal gap between each mark constitutes a realm of silent bodily deliberations that subtends a drawing’s visible residues. Writing in 1952, French philosopher Maurice Merleau-Ponty, having just considered the wavering and wandering of Matisse’s hand as it was revealed in a section of slow-motion film footage, wrote of the necessity of attending to ‘the threads of silence that speech is mixed together with.’40 Matisse referred to the pure line drawings which dominate his Thèmes et variations (1941–2) as ‘the cinema of my sensibility’.41 The drawn marks, which he described as ‘plastic writing,’42 activate the white space of the page to produce what art historian John Elderfield referred to as ‘flashing frames of light’.43 In 1939 Matisse wrote, ‘My line drawing is the purest and most direct translation of my emotion … [W]hich should speak without clumsiness, directly to the mind of the spectator.’44 Both Matisse’s emphasis on the achievement of the single lightning stroke and his expressive rhetoric are a long way away from the priorities of much contemporary drawing. However, Merleau-Ponty’s attention to the ‘threads of silence’ with which utterances are woven together is worth pursuing in relation to drawing’s particular form of ‘cinema by other means’. Such attention would encourage an exploration of the drawing process, and specifically of what happens in the temporal gaps between strokes. The working practice of William Kentridge is particularly suggestive in this regard. Art is maintained, at least at the level of process, as a space of relative freedom and improvisation, but one which gets its meaningful bearings from wider social conditions. Perhaps mindful of rehearsing problematic claims regarding the kind of access drawing provides to the artist’s inner life, Kentridge is understandably tentative in asserting the specific connection between his marks and his thought. Nevertheless, he does frequently maintain a link, referring to drawing as ‘a slow-motion version of thought’,64 and to his studio as ‘like an enlarged head’.65 Dean also affirms a connection: ‘Thinking too becomes analogue when it is materialised into a concrete form; when it is transmuted into lines on paper or marks on a board. It is as if my frame of mind is analogue when I draw’.66 What, then, might it mean to be in an ‘analogue frame of mind’, or to see mental operations from the point of view of the analogue/digital binary? Long thought lost and only rediscovered in a London storeroom in 2004, Dean’s Sixteen Blackboards 1992 (figs.4–5), engages directly with the relationship between drawing, thinking and analogue media. 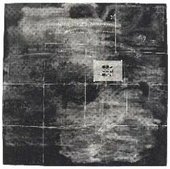 The work consists of a series of sixteen photographs (each 50 x 50cm) of a single blackboard, taken by the artist over a period of weeks whilst studying at the Slade in 1991 (the exact timing of each photograph and the length of the intervals between shots were not recorded). The photographs offer a fragmentary record of a working studio tool, the panel having functioned as a screen for the projection of thought, indexed in the form of sketches, diagrams and notes, rapidly set down and soon rubbed away. Rather than charting the progress of a single project, Sixteen Blackboards witnesses the emergence, recession and sometimes cohabitation of several lines of enquiry emerging simultaneously. While many images clearly relate to specific films made by Dean, many drawings and notes remain unanchored from particular works realised in film.67 Like thoughts and memories, these various markings have unequal life spans: some details arrive in one image only to reappear scrubbed out in the next; others outlive the notes or images that initially provided their framing context by several boards; still others are only ever present as smudges: thoughts receding too quickly to be registered. The introduction of collaged elements, complete upon arrival and removed with no residue, foils this cloudy texture of inscription and unbecoming. This conception of the embodied mind’s enframing of incoming stimuli bears importantly upon the question of the reception of art works. 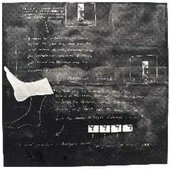 To pursue this might be to shift emphasis from the registration of thought in the act of making, towards a consideration of the way in which the object is de-actualised in thought upon reception.77 Certainly, the aesthetic coherence and potency of the work of both Dean and Kentridge could be accommodated into such a discussion. This might serve to counter the affective atmosphere of nostalgia that often pervades a consideration of the attachment to the analogue in a digital age, by directing the purchase of the term analogue to the liveliness generated at the interface of artworks and bodies rather than to a given set of visual technologies only. Finally, the category of drawing, too, may be seen as re-energised as it enters into transformative relation with the other visual technologies with which it shares space; and in maintaining contact with these new forms, the qualities and capacities of existing modes of drawing are given new visibility and purchase. 1. Michael Newman, ‘The Marks, Traces, and Gestures of Drawing’ in Catherine de Zegher (ed. ), The Stage of Drawing: Gesture and Act, London and New York 2003, p.105. 2. Although of course the word ‘photography’ itself means ‘drawing or writing light’, the Greek word graphein meaning to write, draw or scratch. For a discussion of the relationship between drawing and the early history of photography, see Ann Bermingham, ‘Drawing in the Age of Mechanical Reproduction’, in Learning to Draw: Studies in the Cultural History of a Polite and Useful Art, New Haven and London 2000, pp.228–46. 3. See, for example, Laura Mulvey, ‘The Index and the Uncanny,’ in Carolyn Bailey Gill (ed. ), Time and the Image, Manchester 2000, pp.139–48, and ‘Passing Time: Reflections on Cinema from a New Technological Age,’ Screen, vol.45, no.2, Summer 2004, pp.142–55. 4. Henri Michaux, ‘To Draw the Flow of Time’, 1957, in Catherine de Zegher (ed. ), Untitled Passages by Henri Michaux, New York 2000, p.7. 5. Useful surveys of this material include, Theodora Vischer and Isabel Friedli (eds. ), Tacita Dean: Analogue – Drawings 1991–2006, Basel and Göttingen 2006, and Mark Rosenthal (ed. ), William Kentridge: Five Themes, San Francisco and New York 2010. A key moment for Kentridge was the exhibition of History of the Main Complaint (1996) at Documenta X in 1997; as Rudolf Frieling has noted, this was also an important moment for Internet-based art, shown here at a major international arts festival for the first time. The next year, Kentridge would show his ‘Drawings for Projection’ at The Drawing Center in New York (see Frieling, ‘Walking and Looking, Technology and Agency in William Kentridge’s Film Work’ in William Kentridge: Five Themes, p.159). In 1997 Tacita Dean exhibited The Roaring Forties: Seven Boards in Seven Days in New York, and, following shows at the Witte de With in Rotterdam, and at Frith Street Gallery that year, was nominated for the Turner Prize in 1998. 6. See, for example, their responses to the questionnaire posed by Rosalind Krauss and George Baker, ‘On Obsolescence’, October 100, Spring 2002. pp.16–18 and 26–7. 7. Lev Manovich, The Language of New Media, Cambridge and London 2001, p.27. 9. Manovich identifies the other characteristics as modularity, automation and variability. See ibid., pp.27–48. 10. Friedrich Kittler: Gramophone, Film, Typewriter, Stanford 1999, pp.1–2. 11. Mark Hansen: New Philosophy for New Media, Cambridge MA and London 2004, pp.21–2. 12. Indeed, it was news of the cessation of production of film at Kodak’s factory at Chalon-sur-Saône that led Dean to make her extraordinary paeans to the analogue medium, Noir et Blanc and Kodak (both 2006). See George Baker, ‘Lateness and Longing’, in Daniel Birnbaum (ed. ), 50 Moons of Saturn, Turin 2008, pp.65ff. 13. Dean, ‘Analogue’, in Tacita Dean: Analogue, p.8. While advances in computing power over the last decade or so have put pressure on this aesthetic distinction in the case of still images (see Manovich The Language of New Media, p.53), its purchase regarding the moving image remains. Indeed, Dean’s celebration of analogue film pertains to the whole ‘apparatus’ of that medium, including the physicality of its projection equipment, so the problem is by no means limited to the question of resolution. See Teresa de Lauretis and Stephen Heath (eds. ), The Cinematic Apparatus, London 1980. 14. Dean, ‘Analogue’, in Tacita Dean: Analogue, p.8. 15. A recent conference at Tate Modern, for example, foregrounded the consequences of photography’s ‘automatic’ production of images for a conception of authorial agency and its bypassing. ‘Agency and Automatism – Photography as Art since the 1960s’, Tate Modern, London, 10–12 June 2010. At this conference Margaret Iversen presented a very suggestive paper entitled ‘Analogue: On Tacita Dean and Zoe Leonard’, with which the present essay shares many concerns, although given my focus on drawing the directions of our arguments are rather different. 16. See Otto Croy, Retouching: Corrective Techniques in Photography, London 1970. 17. For the activities of SIGGRAPH and Ars Electronica, visit http://www.siggraph.org/ and http://www.aec.at/center/en/ausstellungen/. Charlie Gere has provided relevant surveys of new media art practices in ‘New Media Art and the Gallery in the Digital Age’, Tate Papers, Issue 2, Autumn 2004 and his book Digital Culture, London 2008. 18. This is not the case, however, for Wacom’s Cintiq range, which incorporates an LCD into the tablet itself, so that the marks appear just below the surface as it is worked. 19. Walter Benjamin: ‘A Small History of Photography’ (1931), in One-Way Street, London 1979, pp.240–57 and ‘The Work of Art in the Age of Mechanical Reproduction’ (1936), in Illuminations, London 1999, pp.211–44. 20. For useful discussions of this issue, see David Rosand, Drawing Acts: Studies in Graphic Expression and Representation, Cambridge 2002, pp.1–23 and Norman Bryson: ‘A Walk for a Walk’s Sake’ in de Zegher (ed. ), The Stage of Drawing, pp.149–58. 21. See Newman: ‘The Marks, Traces, and Gestures of Drawing’, especially p.103, and Pamela Lee, ‘Some Kinds of Duration: The Temporality of Drawing as Process Art’, in Cornelia Butler (ed. ): Afterimage: Drawing Through Process, Los Angeles and Cambridge MA 1999, pp.25–48. 22. Henri Focillon: The Life of Forms in Art, quoted by Pamela Lee, ‘Some Kinds of Duration’, p.31. 23. See Briony Fer, The Infinite Line: Remaking Art After Modernism, New Haven and London 2004, especially chapters ‘Infinity’, ‘Studio’, and ‘Utopia’. The huge range of papers and other surfaces which support the drawn mark should also be acknowledged: graph papers, tracing papers, musical score sheets, diary pages, cardboard scraps, linoleum floor panels, blackboards, gallery walls, family photographs, newspaper spreads, and miscellaneous objects such as skulls and footballs, have all functioned as the receptive surfaces for contemporary drawings. 24. Even if, until data is over-written, it is still retrievable from the hard disk (and hence the problem of data remanence). 25. Hereafter, I will follow Theodora Vischer and Isabel Friedli’s catalogue raisonné of Dean’s drawings in referring to individual blackboards as BD1, BD2, etc. 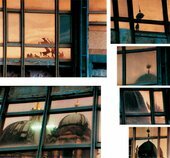 See Tacita Dean: Analogue. 26. These began with Girl Stowaway 1994, and continued with Disappearance at Sea, I-VI, 1995; The Lure of the Sea, 1997, Sea Inventory Drawings, 1998, The Sea, with a Ship; Afterwards an Island, 1999, and Wake 2000. Since moving to Berlin in 2000, Dean has also made Chère petite soeur, which formed part of her 2002 exhibition in Dusseldorf relating to the work of Marcel Broodthaers. 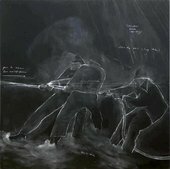 The only series of blackboard drawings not connected with the sea is a triptych produced in 1995 in connection with Dean’s film of the same title, The Martyrdom of St Agatha. 27. Dean, ‘Marina Warner in conversation with Tacita Dean’, in Tacita Dean, London and New York 2006, p.25. 28. Dean in conversation with the author, 2 May 2007. 29. See Ernst Gombrich, ‘Leonardo’s Method of Working Out Compositions’ Norm and Form – Studies in the Art of the Renaissance, vol.1, Oxford and Chicago 1966, p.58–63, and, for a more recent discussion, Robert Zwijnenberg, The Writings and Drawings of Leonardo da Vinci, Cambridge 1999, especially pp.60–82. 30. See Dean: ‘Once Upon a Different Sort of Time – The Story of Donald Crowhurst’ and ‘Disappearance at Sea’ in Roland Groenenboom (ed. ), Tacita Dean, Barcelona 2001, pp.34–43. 31. The projection equipment was installed upright in the gallery space, allowing viewers to watch the reel of film as it ran before the lens. Here Dean makes a reflexive connection between the beam of the projector and that of the lighthouse. For a compelling discussion of the film in relation to questions of medium, see Tamara Trodd: ‘Lack of Fit: Tacita Dean, Modernism and the Sculptural Film,’ Art History, vol.31, no.3, June 2008, pp.368–86. 32. Talking to Roland Groenenboom, Dean said: ‘I call them dysfunctional storyboards. They are non-chronological … But there is always an action, a passage of time going on within each blackboard. They are not still images, but rather in-between images. They have a very hybrid quality.’ ‘A Conversation with Tacita Dean’, in Groenenboom, Tacita Dean, pp.93–7. 33. According to the annotations on the blackboards themselves, BD1–7 were produced on the following days respectively: Wednesday, Saturday, Monday, Sunday, Tuesday, Friday and Thursday. 34. Dean quoted by Theodora Vischer, ‘The Story of Linear Confidence,’ in Tacita Dean: Analogue, p.18. 35. Pavle Levi: ‘Cinema by Other Means’, October 131, Winter 2010, p.53. 37. Newman: ‘Medium and Event in the Work of Tacita Dean’ in Tacita Dean, London 2001, p.24. 38. Dean in conversation with the author, 8 September 2010. 39. See my ‘The Truant Hand and Cinematic Drawing in Matisse’s Themes and Variations’, Object, vol.8, 2006, pp.66–84. 40. Maurice Merleau-Ponty: ‘Indirect Languages and the Voices of Silence’, in Galen Johnson (ed. ), The Merleau-Ponty Aesthetics Reader, Evanston 1993, pp.83–4. 41. Henri Matisse to Francis Carco: ‘Interview with Francis Carco’, in Jack Flam (ed. ): Matisse on Art, Berkeley and Los Angeles 1995, p.135. 42. Matisse, ‘Notes of a Painter on His Drawing’, Matisse on Art, p.131. 43. John Elderfield, The Drawings of Henri Matisse, London 1984, p.123. 44. Matisse, ‘Notes of a Painter on His Drawing’, Matisse on Art, pp.130–1. 45. My discussion is indebted to Rosalind Krauss’s important essay, ‘The Rock: William Kentridge’s Drawings for Projection’, October 92, Spring 2000, pp.3–35. 46. Kentridge in Carolyn Christov-Bakargiev, William Kentridge, Brussels 1998, p.68. 47. Kentridge, ‘‘Fortuna:’ Neither Program nor Chance in the Making of Images.’ in Carolyn Christov-Bakargiev, Dan Cameron and J.M. Coetzee, William Kentridge, London 1999, pp.118–19. 49. Kentridge in Krauss, ‘The Rock’, p.7. 50. Barbara Maria Stafford: Visual Analogy: Consciousness as the Art of Connecting (1999), p.138. 51. Merleau-Ponty, ‘Indirect Language,’ p.82 and 83. 52. Kentridge, ‘Fortuna’, pp.118–19. Dean’s working methods also famously involve a precise attunement to the arrival unforeseen opportunities. See, for example, her text accompanying Girl Stowaway 1994, which relays an extraordinary series of coincidences attending her engagement with the story of the Australian self-smuggler Jean Jeinnie. More recently, in her book W.G. Sebald, Dean relays another story that travels full-circle through a series of bizarre connections and synchronicities (See Tacita Dean, ‘W.G. Sebald’, in Tacita Dean, seven books, Paris and Göttingen 2003). Relevant, too, is the logic of objective chance which was allowed to govern the formation of the exhibition that Dean curated in 2005 (see An Aside, London 2005, see especially p.4). 53. Kentridge, ‘Soho and Felix’ in Five Themes, p.67. 54. Kentridge in Michael Auping, ‘Double Lines, A ‘Stereo’ Interview About Drawing with William Kentridge’, ibid., p.235. 55. Kentridge, ‘Artist in the Studio’, ibid., p.13. 56. Krauss, ‘The Rock’, p.12. 58. See also Krauss: ‘Re-Inventing the Medium’, Critical Inquiry, volume 25, Winter 1999, pp.289–305, and A Voyage on the North Sea: Art in the Age of the Post-Medium Condition, London and New York 1999. 59. Krauss, ‘The Rock’, p.34. 61. Kentridge in ‘Double Lines,’ in Five Themes, p.233. 62. See John Roberts, The Intangibilities of Form, Skill and Deskilling in Art after the Readymade, London and New York 2007. For a forceful discussion of these issues in relation to drawing specifically, see Benjamin Buchloh, ‘Hesse’s Endgame: Facing the Diagram’, in Catherine de Zegher (ed. ), Eva Hesse Drawing, New York 2006, pp.117–50. 63. Kentridge in ‘Double Lines,’ in Five Themes, p.233. 64. Kentridge in conversation with Carolyn Christov-Bakargiev: ‘Interview’, in Christov-Bakargiev 1999, p.8. 65. Kentridge, ‘Artist in the Studio,’ in Five Themes, p.13. 66. Dean: ‘Analogue,’ in Tacita Dean: Analogue, p.8. 67. For example, there are references to Dean’s The Story of Beard (realised in 1992, BD7), and to The Martyrdom of St Agatha (realised in 1994, BD9–11), and, self-reflexively, to Sixteen Blackboards itself (BD14). But alternatively, BD3 announces the title of what was perhaps an unmade work, ‘The Story of Perfect Feet’, accompanied by notes concerning the imperfect gait of ‘an Oedipus’ (swollen foot) or ‘a Byron’ (with his club foot). As with Kentridge, the connections between drawing, film and walking are foregrounded, with the resonance of the term ‘footage’ not lost on the artist. (Tacita Dean in conversation with the author, 1 December 2006). Dean explored the connection between walking and film in Boots (2003). 68. While studying at Falmouth Art College in the late 1980s, Dean produced an undergraduate dissertation on Twombly, October 2003, she gave a talk on the artist at the Dia Art Foundation: ‘Tacita Dean on Cy Twombly’; and in 2008 she published an essay on Twombly, ‘A Panegyric’, in Nicholas Serota (ed. ), Cy Twombly, Cycles and Seasons, London 2008, pp.32–41. Beuys was included both as a maker and as a subject in ‘An Aside,’ the Hayward Touring Exhibition that Dean curated in 2005, and which was installed at the Camden Arts Centre, London. In 2007 she made a film, Darmstädter Werkblock, inside the Block Beuys installation at the Hessisches Landesmuseum in Darmstadt. 69. Beuys to Bernice Rose, 18 June 1984, in Rose, ‘Joseph Beuys and the Language of Drawing’, in Rose and Ann Temkin (eds. ), Thinking is Form: The Drawings of Joseph Beuys, London, New York and Philadelphia 1993, p.73. 70. Krauss, ‘The Rock’, p.20. 71. Kittler: Gramophone, Film, Typewriter, p.2. 72. Brian Massumi, Parables for the Virtual – Movement, Affect, Sensation, Durham and London 2001, pp.138–9. On the implications of a different kind of enquiry into art’s relationship with mental activity, this time from the point of view of neuroscience, see Norman Bryson: ‘Introduction: The Neural Interface,’ in Warren Neidich: Blow Up: Photography, Cinema and the Brain, New York 2003, pp.11–19. 73. Massumi, Parables for the Virtual, p.142. 77. Recent explorations of the issue of spectatorship in relation to the work of both Dean and Kentridge include Rudolf Frieling, ‘Walking and Looking, Technology and Agency in William Kentridge’s Film Work’ in Five Themes, pp.154–69; Christine Ross, ‘Media Skin as Temporal Passage,’ unpublished conference paper delivered at the Association of Art Historians Annual Conference, Manchester, April 2009; Briony Fer: ‘A Natural History of Chance,’ in Rina Carvajal (ed. ), Tacita Dean: Film Works, Miami and Milan 2007, pp.7–42. This paper developed out of the final chapter of my PhD thesis, Drawing Time: Trace, Materiality and the Body in Drawing after 1940 (University of London 2007). I wish to thank Briony Fer for her supervision and guidance during the preparation of that chapter. I also wish to thank Tacita Dean for her generosity in talking with me, Dale McFarland at Frith Street Gallery for his help in making images of her works available to me, and Tamara Trodd and Jo Applin for their insightful comments on drafts of the present essay. This and other articles on the theme ‘On Drawing’ in Tate Papers no.14 were developed from a conference of the same name, convened by Jo Applin and Michael White and held at the History of Art Department in the University of York in June 2009. Ed Krčma is Lecturer in History of Art at University College Cork. Ed Krčma, ‘Cinematic Drawing in a Digital Age’, in Tate Papers, no.14, Autumn 2010, https://www.tate.org.uk/research/publications/tate-papers/14/cinematic-drawing-in-a-digital-age, accessed 25 April 2019.